Comeragh College is a co-educational post primary school. Academic excellence is promoted in a caring environment. It has been at the centre of life in Carrick on Suir for almost 90 years. Welcome to the Comeragh College website. I hope that your visit here will give you a flavour of our school which has offered, and continues to offer quality education for life in an innovative, responsive and caring learning environment. Students of Comeragh College are supported, encouraged, cared for and feel a real sense of belonging. We promote academic excellence and immersion in school life. Our school has and will continue to have a history of success in extra-curricular and co-curricular activities. This allows students to have an opportunity to grow and develop their skills outside the classroom. 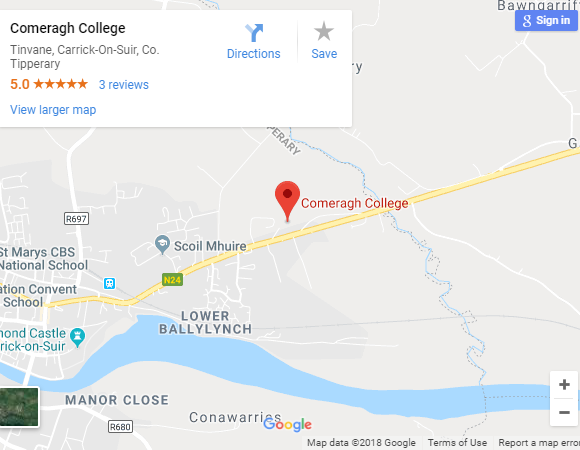 I am happy to serve as Principal of Comeragh College and honour its legacy of excellence for the people of Carrick-On-Suir and its surrounding areas. I am very grateful to have a talented and dedicated staff to ensure that our students are in an environment that is conducive towards learning. While browsing our site, I hope you gain a better understanding of our school and its culture.